The ancient village of Gourdon sits on a rocky point directly above the Loup River in Provence, France. Gourdon village sits on the edge of a rocky spur that extends out approximately 500 meters overlooking the Loup River in France. This old-fashioned village depicts yellow-stoned houses situated on the top of a hill surrounded by streets full of exquisite boutiques. Many tourists come to Gourdon for the outstanding scenery and to visit the amazing little village that sits upon the rock cliff. 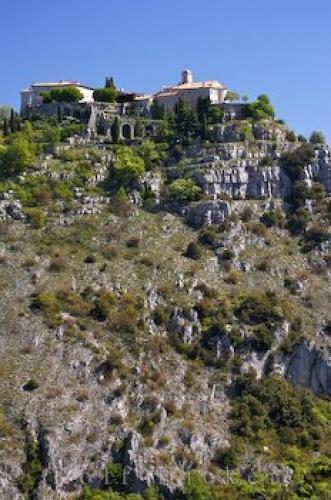 Village of Gourdon, Village Perche, Alpes Maritimes, Provence, France, Europe. a rocky cliff in Provence, France.